“How much did you spend on healthcare last time you were hospitalized?” That was the question Women’s World Banking’s research team posed to more than 70 participants of focus groups organized in Uganda early this year as part of our project to introduce a health microinsurance product with our local network member. The question seems straightforward enough, a simple matter of sums. As we found however, most of the participants were not aware of the full cost of their hospitalization and even severely underestimated it. Women’s World Banking undertook customer research in partnership with our local network member Finance Trust Bank (FTB) earlier this year. FTB and Women’s World Banking are working together to develop and offer a health microinsurance product to help alleviate the financial burden of major illness for their low-income clients. We began our product development work as all Women’s World Banking projects do: with in-depth market research. In order to create financial products tailored to a specific market, we must first understand their lives, needs and aspirations. Specifically in Uganda, we needed to understand the usage, needs, financing and costs for healthcare among the low-income population, as well as their awareness of insurance. An accurate accounting of the true costs of healthcare is critical if we are to properly design and implement FTB’s health microinsurance product. Our conversations with low-income Ugandans revealed a population not fully aware of all the costs involved in healthcare, seeing only the tip of a large, expensive iceberg. Take the case of Kissa, a woman living in rural Uganda, married with six children. She runs a grocery store while her husband farms and rears cows. When she was about to deliver her last baby, Kissa and her husband had to go to a nearby clinic because there were no hospitals near her home. After one night of hospitalization, the attending staff recognized that she needed a C-section and referred her to a hospital. The couple then had to take public transportation to a government hospital 10 km away from their home. When they reached the hospital at 8pm, they had to wait several hours before she could be admitted. Thankfully, she was scheduled to have surgery at 1pm the next day. Prior to surgery however, her husband was asked to buy some materials that were deemed necessary for the procedure, among them cotton, plastic sheeting and bandages. While these supplies are usually free in other countries, it is common practice in Ugandan government hospitals, which don’t charge admission or fees for treatment, that patients cover the cost of their supplies. The surgery went well and Kissa and the baby stayed in the hospital for four days to recover, with her husband by her side the whole time. They paid for the hospital costs with the family’s savings and, to cover the rest, her husband had to sell a cow. Due to their urgent need for money to pay the hospital (patients must pay their bill in full before they are allowed to leave the premises), he sold it for USh 100,000 (US$ 40) less than it was worth (the cow’s fair market value was USh 600,000 or $240). 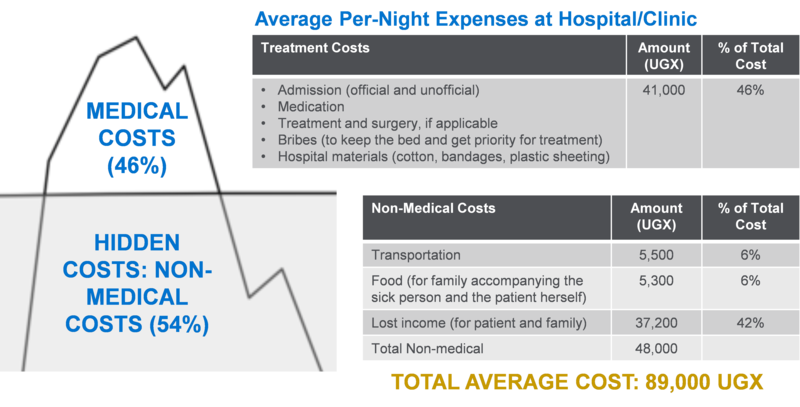 Kissa’s story illustrates the fact that patients often don’t consider the indirect expenses related to their healthcare, and can easily underestimate the true cost of being hospitalized. Using data from clients interviewed during our research, Women’s World Banking found that respondents were conscious of less than half of their total healthcare costs. As the graph shows, the bulk of the expenses lie in non-medical costs which account for over 54% of the total costs. Covering all these expenses is critical if a health microinsurance product is to provide a tangible benefit to FTB’s low-income clients. Women’s World Banking is working with the institution to adapt Caregiver, a hospital-cash insurance product we have successfully launched in Jordan with our network member Microfund for Women and are currently piloting in Peru with our network member Caja Arequipa. Apart from providing a product that will shorten the long road Ugandans often take to access healthcare (see previous post), FTB’s Caregiver is intended to give their low-income clients the ability to prepare for and manage both medical and non-medical expenses related to illness. One of the findings of the study was the way health costs are dealt with among low-income Ugandans. Without a financial safety net to meet unexpected costs, clients first use all their available cash on hand, including working capital and savings. If that is not enough, they, like Kissa, are then forced to borrow money or sell assets, imperiling their source of income and means to financial stability. The Caregiver product would represent a great opportunity to help provide low-income Ugandans with the financial security of an insurance policy that meets their critical healthcare needs, improving their health outcomes and quality of life overall.